The cultivation of rice results in two types of biomass residues – straw and husk – having attractive potential in terms of energy. Rice husk, the main by-product from rice milling, accounts for roughly 22% of paddy weight, while rice straw to paddy ratio ranges from 1.0 to 4.3. Although the technology for rice husk utilization is well-established worldwide, rice straw is sparingly used as a source of renewable energy. One of the main reasons for the preferred use of husk is its easy procurement. 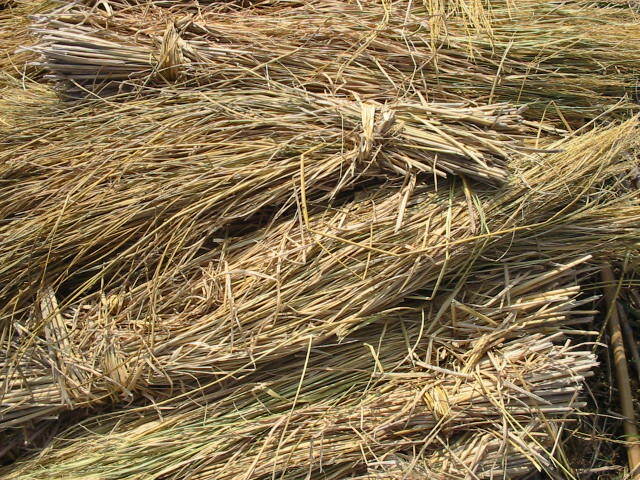 In case of rice straw, however, its collection is difficult and its availability is limited to harvest time. Rice straw can either be used alone or mixed with other biomass materials in direct combustion, whereby combustion boilers are used in combination with steam turbines to produce electricity and heat. The energy content of rice straw is around 14 MJ per kg at 10 percent moisture content. The by-products are fly ash and bottom ash, which have an economic value and could be used in cement and/or brick manufacturing, construction of roads and embankments, etc. Straw fuels have proved to be extremely difficult to burn in most combustion furnaces, especially those designed for power generation. The primary issue concerning the use of rice straw and other herbaceous biomass for power generation is fouling, slagging, and corrosion of the boiler due to alkaline and chlorine components in the ash. Europe, and in particular, Denmark, currently has the greatest experience with straw-fired power and CHP plants. Because of the large amount of cereal grains (wheat and oats) grown in Denmark, the surplus straw plays a large role in the country’s renewable energy strategy. Technology developed includes combustion furnaces, boilers, and superheat concepts purportedly capable of operating with high alkali fuels and having handling systems which minimize fuel preparation. A variety of methods are employed by the European plants to prepare straw for combustion. Most use automated truck unloading bridge cranes that clamp up to 12 bales at a time and stack them 4-5 bales high in covered storage. Some systems feed whole bales into the boiler. Probably the best known whole bale feeder is the “Vølund cigar feeding” concept, originally applied by Vølund (now Babcock and Wilcox-Vølund). Whole bales are pushed into the combustion chamber and the straw burned off the face of the bale. However, the newer Danish plants have moved away from whole-bale systems to shredded straw feed for higher efficiency. For pulverized coal co-firing, the straw usually needs to be ground or cut to small sizes in order to burn completely within relatively short residence times (suspension fired systems) or to feed and mix upon injection with bed media in fluidized bed systems. The chemical composition of feedstock has a major influence on the efficiency of biomass cogeneration. The low feedstock quality of rice straw is primarily determined by high ash content (10–17%) as compared with wheat straw (around 3%) and also high silica content in ash. On the other hand, rice straw as feedstock has the advantage of having a relatively low total alkali content, whereas wheat straw can typically have more than 25% alkali content in ash. However, straw quality varies substantially within seasons as well as within regions. If straw is exposed to precipitation in the field, alkali and alkaline compounds are leached, improving the feedstock quality. In turn, moisture content should be less than 10% for combustion technology. In straw combustion at high temperatures, potassium is transformed and combines with other alkali earth materials such as calcium. This in turn reacts with silicates, leading to the formation of tightly sintered structures on the grates and at the furnace wall. Alkali earths are also important in the formation of slag and deposits. This means that fuels with lower alkali content are less problematic when fired in a boiler. Tagged Alakaline, Ash, baling, Biomass, boiler, Chlorine, CHP, cogeneration, Combustion, Combustion of Rice Straw, Denmark, Paddy, Paddy Residues, Silica, Slag, Straw, Uses of Straw. Bookmark the permalink. Please, can i get a complete book on this? Unfortunately we dont have any book on this topic.